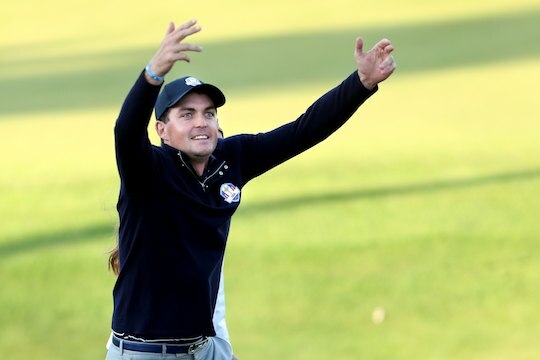 USA have taken a commanding 10-4 lead over Europe following the second day of the Ryder Cup in Chicago thanks mainly to the pairing of Keegan Bradley and Phil Mickelson. The Americans need just 5 1/2 more points in the final two sessions to reclaim the diminutive gold trophy. Europe needs 10 points to keep possession. With three wins from three matches at Medinah Country Club, Mickelson and Bradley have become Ryder Cup heroes, propelling their team to what appears certain victory for the Americans. Bradley, in his rookie start and Mickelson, the most experienced member of the American team making his ninth appearance at the biennial competition, have developed the type of chemistry which has proven unbeatable. Bradley made an impressive Ryder Cup debut on Friday, dropping the clinching putt in a 4&3 win over Briton Luke Donald and Spaniard Sergio Garcia in the foursomes. Mickelson had the honours in the afternoon four ball, nailing a tee shot at the 17th to dispose of world number one Rory McIlroy and Graeme McDowell with a 2&1 defeat. Bradley and Mickelson then came out all cylinders in Saturday’s foursomes with a record equalling 7&6 thrashing of Lee Westwood and Donald to the thundering approval of the pro-American crowd. USA captain Davis Love III decided to give his lead pair a rest from Saturday afternoon’s four ball matches to have them fresh for Sunday’s singles. “Phil gets his break this afternoon and he was asking for his break,” said Love. Yet the Europeans are fighters and as with all Ryder Cup encounters there is pride at stake. “We are in a hole,” said Graeme McDowell.